The Texas Rangers have a talented young minor leaguer who is swiftly and impressively making his way to the big leagues. I could tell you, here, about his quick bat, or his range at second base. I’d like to tell you about his sturdy build and his marked on-field nasty streak. I would, if I were a scout, hasten to mention that he is a “yes sir, no sir” kid when he’s not between the lines. I would, because I am a not a scout, almost certainly tell you about the time he told me he was really going to miss his meals at Panda Express when he went home to Venezuela. But I can’t do this. Not until we get something out of the way. It's his name, and it’s a doozy, and it’s pronounced “ROOG-ned o-DOOR.” If you have read this name at any time in the past—and if you're a prospect-watcher, or a fan, or someone who follows The Classical's David Roth on Twitter —you were probably wondering about that. 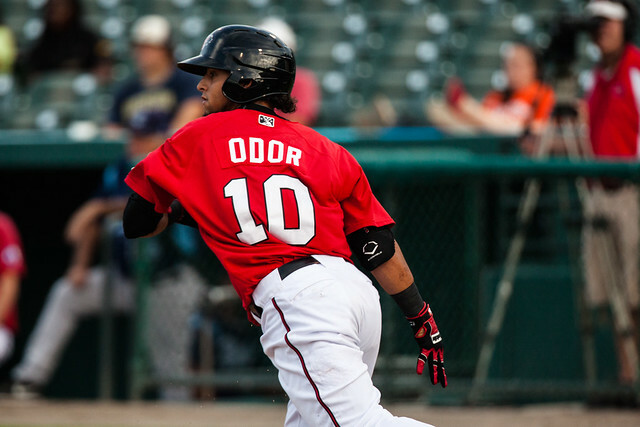 Since Rougned Odor’s arrival as a 16-year-old free agent from Maracaibo, his teammates, coaches, fans, and basically everyone else, have just called him “Roogie.” This is for convenience, but it is also important—he’s not alone, there are other Odors. Uncle Rouglas, for instance, just completed his 26th season with the Indians organization. There’s older cousin Rouglas who once walked on to West Virginia’s football team, then did the same thing with Fordham’s. There’s also younger cousin Rouglas, a promising high school baseball player in Florida. And of course, we can’t leave out Rougned’s 16-year-old brother, currently in Miami prepping for Major League Baseball’s July signing period. That younger brother’s name is—wait for it—Rougned Odor. Not only is there more than one Rougned Odor in the world, they have the same parents. When I first discovered Rougned the Younger through an internet training tape, I asked the older Rougned if it was his kid brother or just another young Venezuelan shortstop with the same name. “What is the problem if my brother and I have the same name?” he asked me, somewhat heatedly. I told him absolutely nothing was wrong, I just wanted to confirm it was his brother. He said, yes, it was his brother. Then he laughed at me. This is, we might as well admit, pretty damn unique. I don’t want to use the word weird, because, at least if Odor's response is any measure, it's only weird to us. Or… okay, it’s fairly weird. More than anything, though, it's not over yet, for the kid or for us. Cheesy announcers will revel in their self-appointed roles as kings-of-clever, laying out for pun after pun about the young second baseman. It’s inevitable. There is some good news about the player with the best name in baseball though—all this wears off. It wears off because Rougned Odor is very good, and the novelty of his admittedly very novel name dissipates when you see him play day after day. He can hit, he can run, he can catch. He’s got more power than you might think, and he might be the single most competitive minor leaguer I saw in the 60 games I watched in-person last season. I’ve had quite a few scouts tell me they’ve put a 60-grade on him, meaning he could be an everyday player for a playoff contending team. Depending on whom you ask, he’s either the best or second-best prospect in a still-strong Rangers farm system, and he’s been nearly the youngest player on every team and in every league in which he's ever found himself. That, and he's a nuisance. Odor has started at least one bench-clearing brawl and very nearly started a couple more, and yet his teammates vocally adore him. He can sting the ball to the opposite field gap and he pays attention to the count; he’s aware of the game’s incessant nuances and he’s always got his head up. He’s a pathological competitor on the field and has a quick smile and is exceedingly polite off it. This is all sort of a long way of saying that Rougned Odor is even more interesting than his name suggests, and that he is going to be a big leaguer, and possibly a very good one. It’s a funny name, it really is. Funnier still, lots of people are going to be saying it lots o’ times. Remember, it’s pronounced ROOG-ned o-DOOR. It's also how you say his brother's name. Image via Flickr user Julie Fennell. Great blog and a great topic as well I really get amazed to read this. It’s really good. I like viewing web sites which comprehend the price of delivering the excellent useful resource free of charge.